Maricopa County's Mobile Restaurant Ratings app lets people access food inspection results for restaurants, grocery stores, and retail food establishments across the county. In Maricopa County, Arizona, the management team for the Environmental Services Department was sitting on a gold mine of food inspection data. But it needed a better way to get this information to the public than by just depositing it into a difficult-to-search database on its website. Sharing food inspection results encourages businesses to work to reduce the risk of foodborne illnesses and allows consumers to make better-informed choices about where to eat. So Maricopa County developed a GIS app that now puts inspection results at every smartphone user's fingertips. Food-borne illnesses are estimated to cause 48 million cases of sickness, more than 128,000 hospitalizations, and 3,000 deaths in the United States each year, according to the Centers for Disease Control and Prevention. To help curb those numbers, the environmental services department in Maricopa County ensures that food provided to the public in its jurisdiction is safe. Every year, the department conducts more than 60,000 inspections at food establishments. Departmental staff maintain the county's food inspection results, which include overall inspection grades; priority violations, such as insufficient hand washing or incorrect food temperatures; and businesses that participate in the county's food safety partnership, which promotes best practices and recognizes quality food safety systems. Until recently, inspection grades were only available to the public in two ways: businesses that participated in the voluntary grading system could post their grades at their establishments, or the results were available on the county's website. To get a report of the inspection results, interested parties could run a query from the website, searching by inspection date. But the search and reporting features had limited functionality. There was no way for people to see the results for a particular restaurant or for any of the restaurants nearby. So citizens—including the media—often had to contact staff to get more information. This caused delays in the department and decreased efficiency. When a user taps a restaurant on the map to view its ratings history, the information is retrieved in real time from a SQL Server database. 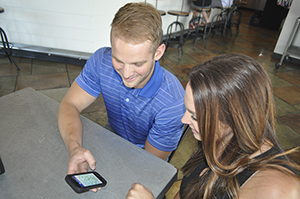 With help from the county's GIS and IT teams, the Environmental Services Department developed a custom web app called Mobile Restaurant Ratings. It provides the same inspection results that the county's website previously offered, except they are now displayed on a map based either on the user's current location or search criteria. Environmental health specialists upload their inspection results daily. A three-day waiting period ensues, which allows businesses to express any concerns they have about the inspection before the results are released to the public. During this time, the Environmental Services Department can correct or clarify any violation details prior to posting the inspection report. After that, the results are available on the app. When a user clicks or taps a restaurant on the map to view its ratings history, the information is retrieved in real time from a SQL Server database. The restaurant locations displayed on the map are stored in a map service hosted on ArcGIS for Server. The county also has an ArcGIS Online organizational account, which allows users to add the map service for restaurants to their own maps and apps. Maricopa County launched its Mobile Restaurant Ratings app in August 2015. 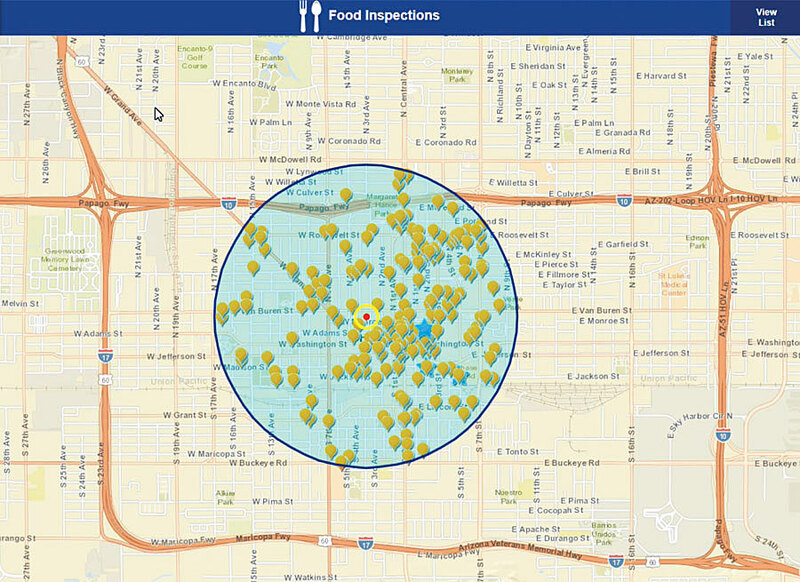 Now, people can access food inspection results for any one of Maricopa County's 8,000 restaurants, 2,200 permitted grocery stores, and 4,800 convenience and retail food establishments. "If you are out on the go and decide to eat at a restaurant that you are not familiar with, you see how they do on their inspections," said Andrew Linton, the Environmental Health Division manager at Maricopa County. "This is a really easy way to get an idea of how they are doing." The app has improved transparency, since inspection violations are now posted on it whether or not a business elects to participate in the grading system. It has also increased public awareness of the benefits the Environmental Services Department provides to the public each day. Local media have taken an interest in the app, writing about it in newspaper articles and doing stories on it for television. In just three months (from when the department first set up web analytics), the number of website hits increased by 17 percent. The Mobile Restaurant Ratings app has also increased interest in the Environmental Services Department's food safety partnership, called the Cutting Edge Program. Participants are featured in a special section of the app, which also provides information about the program. From August 2015 to February 2016, the rate of enrollment doubled from 8 percent to 16 percent compared to the previous six months. 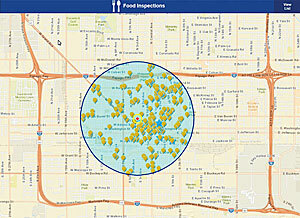 When food industry leaders such as the Maricopa County Restaurant Association, the Arizona Food Marketing Alliance, and several fast-food chains initially approached the Environmental Services Department to see about improving accessibility to food inspection results, developing an app was the immediately preferred plan of action. "The app was a quick solution for a department with limited resources," said Linton. "It has provided a great return on investment by increasing food safety awareness and highlighting the important role [the Environmental Services Department plays] in protecting the health and safety of our community." Tisha Taylor is the management analyst for the Environmental Services Department at Maricopa County, and Mark Brewer is a GIS database administrator there. For more information, email Brewer or call 602-506-2953.